In a quest to reach new audiences for performing arts in Philadelphia, Theatre Philadelphia and thINKingDANCE are joining forces and exploring how dance writing and discourse can provide new perspectives on theatre. Beginning May 2018, tD writers will be lending their varied backgrounds, interests, and approaches to criticism to professional works of theatre in Philadelphia. Let us know what you think in the comments! In September, Philadelphia will be engulfed in the frenzy that is FringeArts’ Fringe Festival. You may be familiar with the annual extravaganza and the vast range of live performances: dance, theater, music, and all sorts of weirdness in between. But were you aware that you could access some Fringe pieces right on your smartphone? The Digital Fringe first started in 2015, and has quietly introduced a whole new type of art to the festival. Digital Fringe pieces—games, podcasts, live streams, and more—are free and available via laptop or smartphone. As a past and current presenter in Digital Fringe, and a former FringeArts intern, I’ve seen firsthand the excitement and confusion surrounding this edge of the festival. Artists are starting to explore the new possibilities of our constantly changing digital technology, but creators and artistic institutions alike are unsure how to promote, market, and support this work. Many problems digital artists face are logistical: how does one monetize a digital artwork? 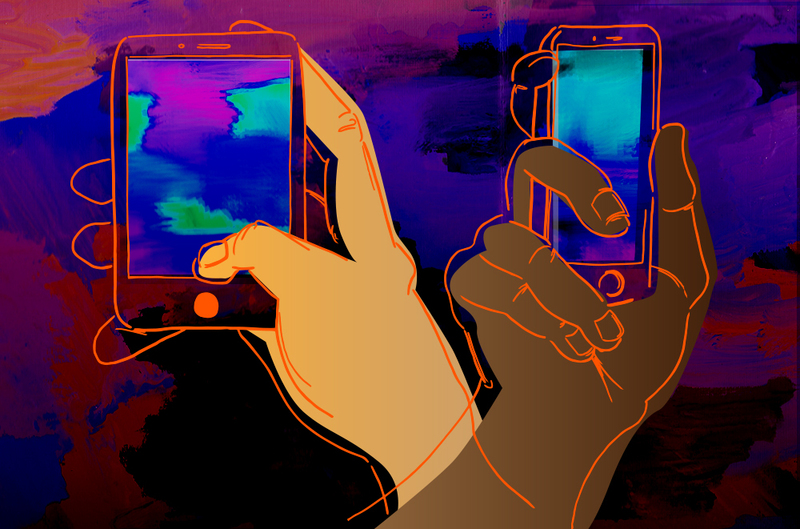 How can digital artists understand their audiences and gain meaningful feedback? What if your viewer has bad WiFi, or hates their smartphone, or doesn’t have unlimited data? There is a larger question, too: What is digital art? I caught up with four presenting artists in this year’s Digital Fringe, each presenting an entirely different take on what “digital art” can mean. Dancer Sean Thomas Boyt’s contribution is a collection of PDF documents that detail instructions for new, short dance works for aspiring soloists, emerging creatives, and unsuspecting passersby. These dances can be performed alone, with others, in front of audiences, or alone at home. Jenny Kessler: How would you define the term "digital art”? Sean Thomas Boyt: I'd define it as works based primarily on the internet, or at least being organized in a way that a viewer or participant must interface with them via some sort of technology for the intended effect. JK: What do you hope to get out of participating in the Digital Fringe this year? STB: For How To Dance, I'm presenting under the Digital Fringe moniker as a means to distribute these unperformed dances to new audiences and potentially new performers. I've been having my PDF Dances produced and performed at festivals and mixed bills for the past couple of years—sometimes while I'm present at the venue, sometimes across the country. They are, to me, an economical alternative to traditional dance-making. I've never been one to have funding for my choreography, so this is a way for me to "outsource" dancers for my work. JK: Do you think the dance world has embraced technology? STB: It seems like, in the current dance landscape, using anything remotely electronic in a work can make it be seen as "experimental" or "technologically-groundbreaking." For a lot of concert dance work, the newer developments that make sense are more streamlined projections, motion-mapping, and live recording. Ideally one doesn't need to pull out too many stops to get to a dance's central aim, but a couple of fun digital tricks can sometimes enhance the work. That said, the introduction of tech and cyber-improvements to dance works that are participatory seems fitting—most of us have a mini computer in our pockets, so I think it's appropriate to accept that dance (like life) doesn't have to exist in a vacuum! Jessica Creane, a collaborative performance artist and game designer, is presenting R&J, a multi-day, pseudo-role-playing game for two people that mirrors the story of Romeo & Juliet. The game takes place over the course of five days and can be played with a friend or, more authentically, with a total stranger. JK: How would you define the term "digital art”? Jessica Creane: I’d say digital art is any creative output that utilizes electronic technology as a core element of process or product. JK: What place do you think technology has in the world of theater? JC: Electronic tech has enabled artists to reach audiences across vast swaths of space and time. It has also made a lot of art a lot more accessible. There are now tons of pseudo-permanent, or at least heavily documented, works of art—not just ephemeral experiences but replicable ones. Still, no matter how often we revisit “archived” movies, games, or taped performances, time moves forward and our experience of that work changes, not unlike theater. JK: What are some of the biggest challenges you faced working on this piece? JC: The first big challenge was finding the right programmer. Max Perlman, the lead engineer on R&J, is incredibly talented and this project wouldn’t have made it to Fringe without him. It’s also been a challenge to figure out the right amount of play time for each day to ensure that the game enhances a player’s day while not destroying their productivity. In previous iterations, it’s been a challenge to get players over the hurdle of asking a complete stranger to play a fairly intimate game. My hope is that that will change with the Philly Fringe. The festival does a brilliant job of bringing the community together; the game is a perfect opportunity for players to get to know, in a playful, silly way, that one person they’ve seen at half a dozen shows. Tom Luther is an improvising composer, pianist, and media artist working in acoustic and electronic environments. A Stroke of Luck is an audio/visual reflection of Luther’s experience recovering from two strokes. Tom Luther: I guess the broadest definition of “digital art” is anything that was created using digital technology. That could be anything from a laptop orchestra to photos taken with an iPhone. For me, it means interdependent and interactive works that change over time. JK: Why did you choose a digitally-based platform to tell this story? TL: I've been very focused on systems-based art forms for several years, mostly using Max 7, so it was really just a natural extension. JK: What are some of the difficulties or challenges of making and sharing digital work? TL: Promotion is a big issue, just getting the work viewed. Most galleries, at least where I live in Maine, aren't set up for digital works. The other issue, sadly, is the work isn't necessarily salable (unless you code it into an app). That's fine for me, but it creates something of a conundrum for galleries to use their real estate for something that has no commission. Online is a bit easier, but the web has become so ubiquitous that getting the work viewed can be tricky, given competition from so much other content. Specific to where I live is the lack of broadband, which precludes any kind of live-streaming forms. On the bright side, because of the internet, your potential reach is much larger, so again it comes down to persistence and patience. Chef Daagh and the Sous is a collaboration between Philly theater artists Christopher, Ashleigh, Meerabelle, Jeremy, and Shreshth, working together on Chez Vous. In this interdisciplinary, in-your-domicile piece, Chef Daagh and company arrive in your home, make you dinner, regale you with live theater, and livestream the proceedings. Chef Daagh: Almost all contemporary art is marketed, documented, ticketed, (crowd)funded, supplemented, or otherwise accessorized online. “Digital art” is mindful of that engagement, bakes it in, exists inseparably from it, as more than just metadata. JK: Did you develop this piece specifically for Fringe, or is this something you’ve been working on for a while? CD: This group and iteration are specific to this Fringe, but Chez Vous shares a universe with the piece Immigrant Kitchen that we presented during the 2018 SoLow Fest. The practice of cooking meals in the homes of relative strangers (or acquaintances-of-acquaintances) is not new; this is the first time we’re putting it online. JK: What do you hope to get out of participating in Digital Fringe this year?